The largest pizza commercially available is 1 m 37 cm (4 ft 6 in) by 1 m 37 cm (4 ft 6 in) and is sold at the Big Mama''s and Papa''s Pizzeria, Los angeles, California. 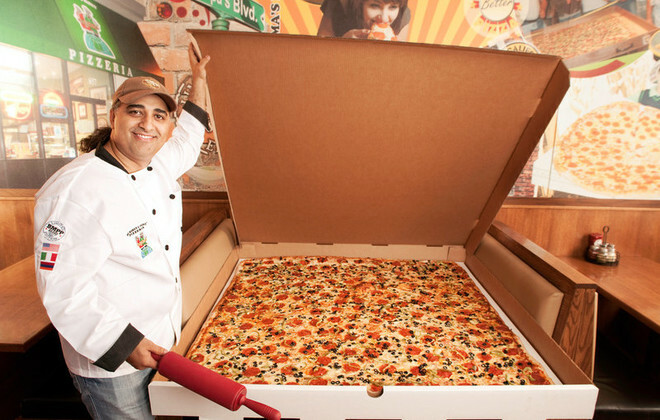 It is a square pizza which is said to serve between 50 and 100 people. It has a cost of $199.99 (plus tax) and is deliverable within a certain area. Mama''s and Papa''s Pizzeria needs a minimum of 24 hours notice to be able to make the pizza and it has proved popular for childrens'' and adults'' parties.